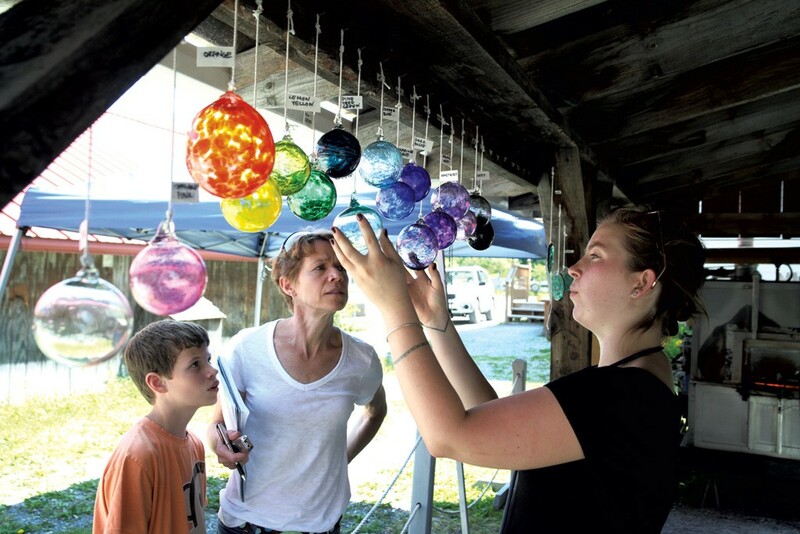 The Art Of... Glassblowing | The Art Of | Kids VT - small people, big ideas! Every summer morning, my sons ask what we're going to do for fun. It is, they remind me, summer vacation. As we melt into August, we've exhausted our go-to list. Beach with friends? Check. Bristol Falls with cousins? Check. Creemees, creemees, creemees? Check, check, check. Thanks to John Chiles, I was able to give an exciting answer last month: learn to blow glass. As part of his dream to take glassblowing to the masses, Chiles, the owner of Orwell Glass, has set up a portable furnace at the Lake Champlain Maritime Museum in Vergennes. There, glassblower Camille Ames teaches novices to blow an ornament and press a sun catcher in 20 minutes. Returning visitors can make a tumbler or vase. You get to work with a 2,025-degree furnace and a glob of shiny, molten glass. It's mesmerizing, Chiles said, "because it's glowing, it's hot and it's moving." It was 86 degrees the morning my 11-year-old son Andrew and I arrived. The open-air studio sits under a slanted roof just outside the museum's blacksmith shop. Colorful glass ornaments hanging from the eaves gave off a cabana vibe. Andrew and I put on safety goggles, and Ames, looking cool in her aviator sunglasses, walked us through the steps of making a spherical hanging ornament. Hot glass is gathered on the end of a 5-foot steel blow pipe, color is added, the glass is rolled along a stainless-steel-topped table to "marver" (shape) it, and then the blowing begins. Throughout the process, the glass goes back into the furnace for reheating to keep it malleable. There, the pipe is slowly, steadily turned as Ames watches for the molten glass to wobble a little, signaling that it's ready to work with again. It's like toasting a marshmallow, only a whole lot hotter. Andrew and I each picked an ornament color — green for him, orange for me — and got started. Ames gathered hot glass from a ceramic crucible inside the furnace, then handed Andrew the pipe. The color, called "frit," is ground colored glass that looks like cookie-decorating sugar. Andrew pushed the hot glass into the frit to make it stick. Ames helped him put the glass back into the furnace to melt in the frit, then he rolled the glass over the marvering table, shaping it into a cylinder. When it was my turn, Ames complimented my steady marvering technique: "You're nice and calm — at least on the surface," she said, which I took as the ultimate mom compliment. After marvering and reheating, Ames "capped a bubble." She blew hard into the pipe and held her thumb over the end to allow the air to enter the glass. A quick reheat of the glass and it was Andrew's turn to blow. On the end of the pipe, Ames attached a rubber hose with a mouthpiece that's sanitized between students. Ames sat on the glassblower's bench rolling the pipe and holding the jacks, a set of giant tweezers, at the point where the glass connects to the pipe. She directed Andrew to blow gently, then progressively harder, and the hot glass ballooned into a sphere. Ames set it on a stand, scored the top with hefty scissors, then tapped the pipe, releasing the ornament onto the stand. She added a dollop of hot glass to form a hook, then popped the ornament into the annealing oven, to allow the glass to cool slowly overnight. To make a sun catcher, we pressed a graphite mold — a fleur-de-lis for Andrew and a snowflake for me — onto a blob of hot glass. 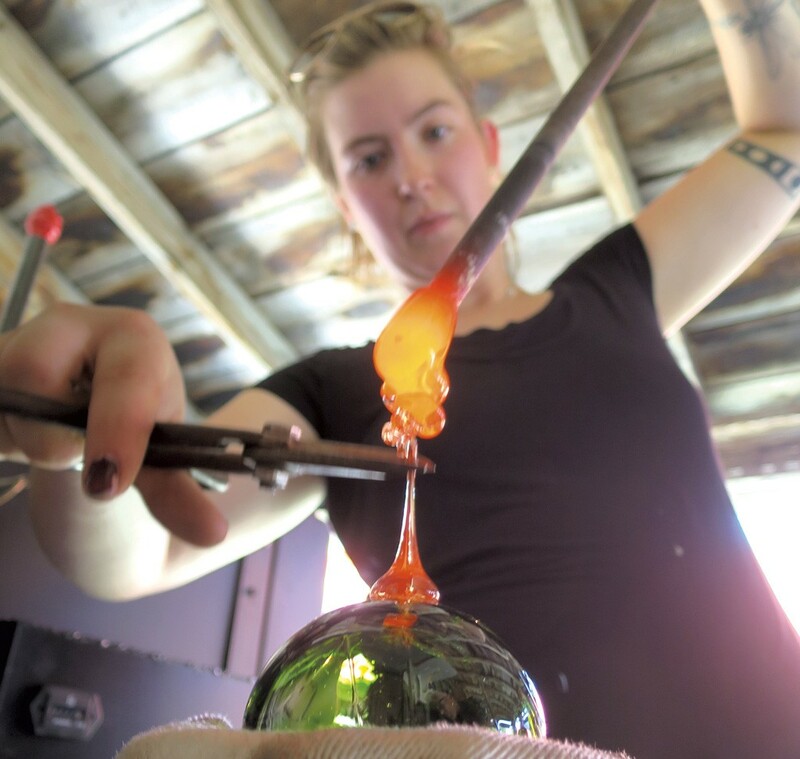 While it's true that you finish feeling like you didn't do much of the work, glass blowing often requires two people, even for the pros, Ames said. "It's very much a team sport." Orwell Glass will ship cooled creations for $15, but we went back to Vergennes to pick up ours. They were waiting on a shelf, inside a paper bag. Opening it was a thrill. "It's so cool," Andrew said. "I love it." Anyone age 7 and older can learn to blow glass at the Lake Champlain Maritime Museum through the end of August. 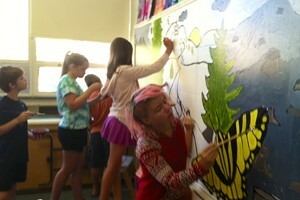 The $45 fee includes a private lesson, an ornament and sun catcher, and admission to the museum. Sign up at orwellglass.com. Wear loose, cotton clothes; under high heat, nylon can turn to shrink wrap. Consider wearing long sleeves if you're sensitive to heat. Make a day of it! Meander through the museum's buildings and eat lunch at the Red Mill Restaurant across the road.